Fall is such a wonderful time of the year to hike! 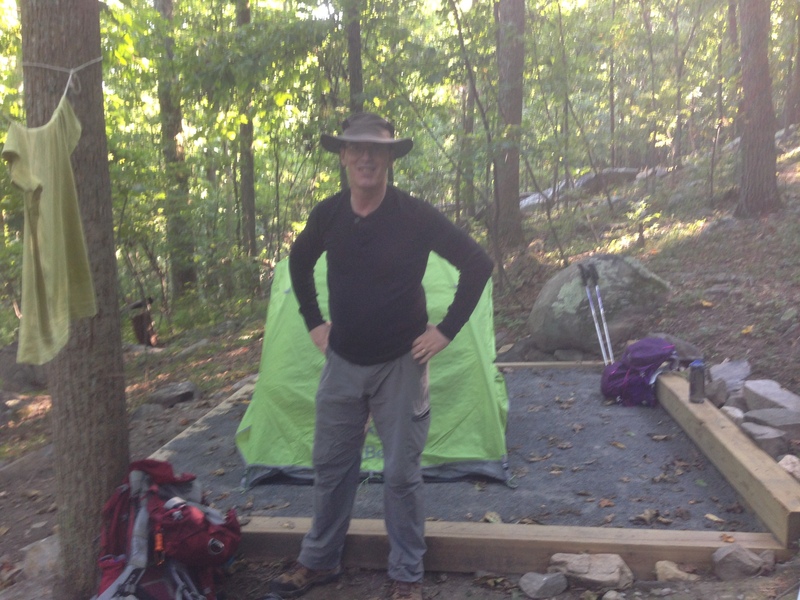 This past weekend Tod and I experienced the West Virginia portion of the Appalachian Trail. We began at Snicker’s Gap, at a parking lot just off of Highway 7. The parking lot was packed with “birders” who were doing counts of the number of hawks, eagles, etc. We accessed the Appalachian Trail from the north end of the parking lot and traveled a short way before we crossed the road to continue the trail. After many miles on rocky trails, this portion of the A.T. is much smoother and relatively flat. It was nice to have an easy beginning to our hike. 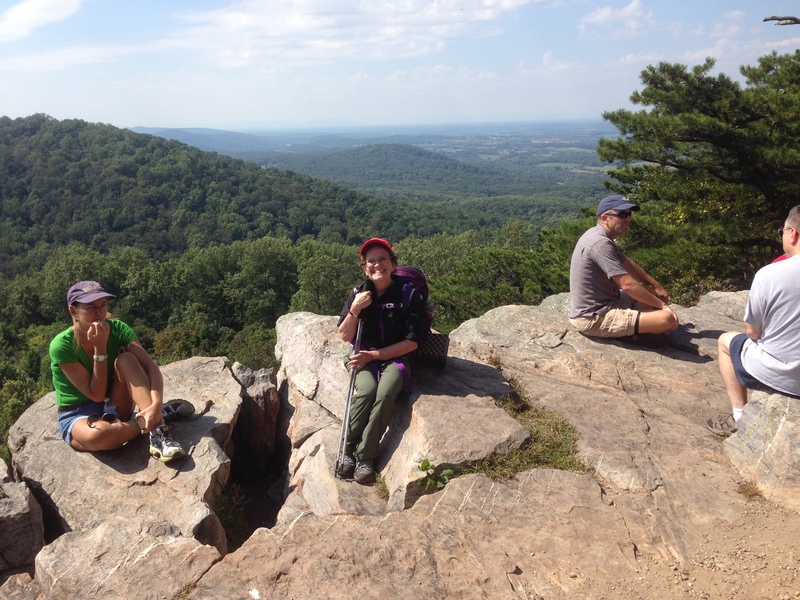 Before long, we arrived at Crescent Rock, a beautiful overlook and a popular destination for day hikers. It wasn’t long before we experienced what is known as the “roller coaster”. This is an area of the trail that, as you might guess, goes up and down. It wasn’t as bad as it sounds! It was near this area that I came close to stepping on a rattle snake that was right on the trail. Yikes! I screamed, more from surprise than from being scared. 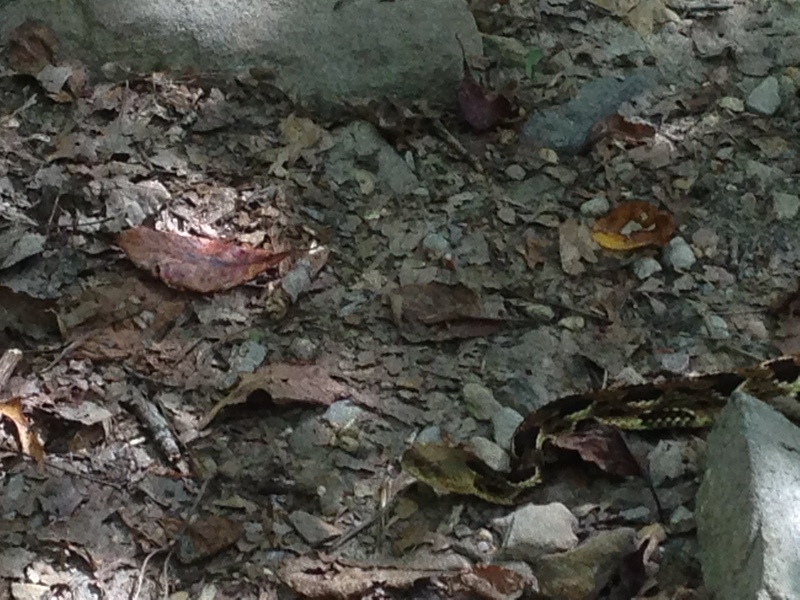 We later learned that the rattle snake is the official reptile of West Virginia. I would have been happy not to run into him. 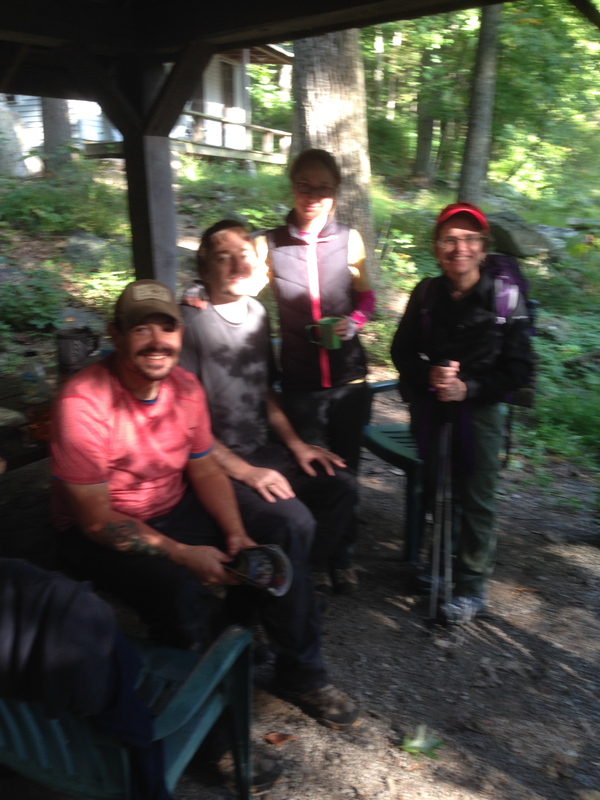 We camped overnight at Blackburn Trail Center and hiker’s hostel. 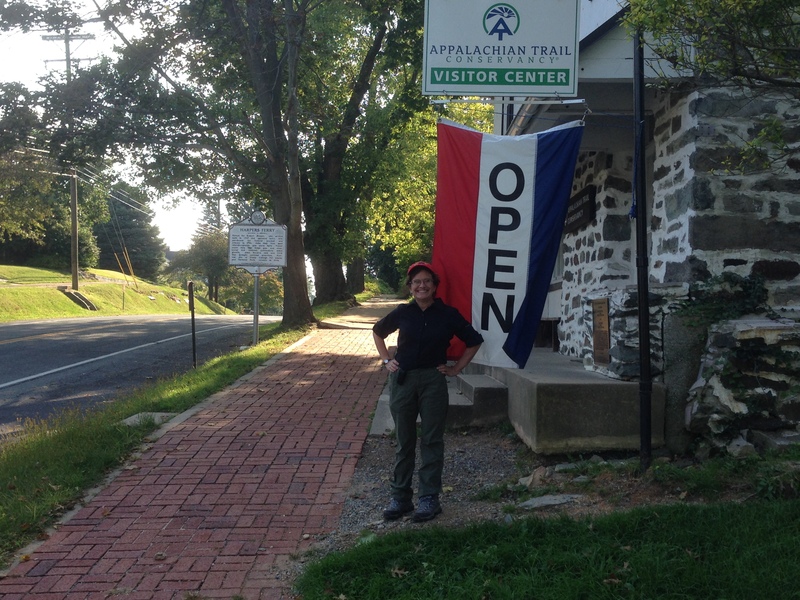 The hostel is located about 8 miles from Snickers Gap, far from the main trail, WAY down a hill! It was a beautiful facility but it was not available to us. It turns out that the Center is rented out during the off-season. That wasn’t a problem. We still had ready access to water. We pitched our tent at one of the many tent sites. We enjoyed a delicious Mountain House dinner (a real treat) and chatted with thru-hiker Steven (trail name Maximus) as well as another couple. The comeraderie on the trail is something that I really like about the A.T. The next morning we were off for the long, 13 mile jaunt to Harper’s Ferry. The trail was relatively smooth but, boy, was it long! We stopped several times for snacks and water but Tod’s toes were definitely feeling the effect of the many miles. The view of the river was a welcome site. Both Tod and I agreed that crossing into Harper’s Ferry from this point is really beautiful. Unfortunately, we were exhausted so the long detour from the trail to the Visitor’s Center seemed like it went on forever. The Visitor Center is well worth the trip. We purchased patches for completing the Maryland and West Virginia part of the A.T. as well as other memorabilia. Who knows what portion of the A.T. we’ll do next! This morning and early afternoon Karen and I were out hiking at Schaeffer Farm, located on the outskirts of Seneca Creek State Park. 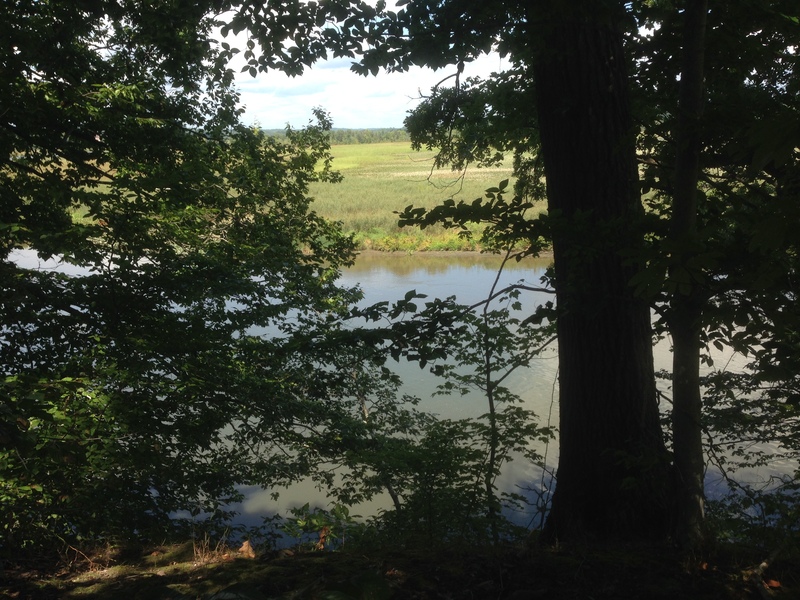 Schaeffer Farm offers a network of over ten miles of trails. These trails are well marked, and maps with one’s location indicated are placed at every intersection, so there is no need to bring one’s own map. Karen and I concentrated on hiking the Yellow Trail, which required also that we hike parts of the White and Blue Trails. All-in-all, we walked about six miles. The trails are perfect for off-road bicyclists, which is, no doubt, why Karen and I came across so many of them. “Behind you, to your left!” “Coming through!” We must have heard these and variations at least twenty times, but there was always the cheery “Thank you!” and “Enjoy your hike!” The trail, always more or less smooth, but sometimes made bumpy with roots, winds through the woods with a gentle undulation. The elevation change is limited to 600 or 700 feet, so one never has to climb much. 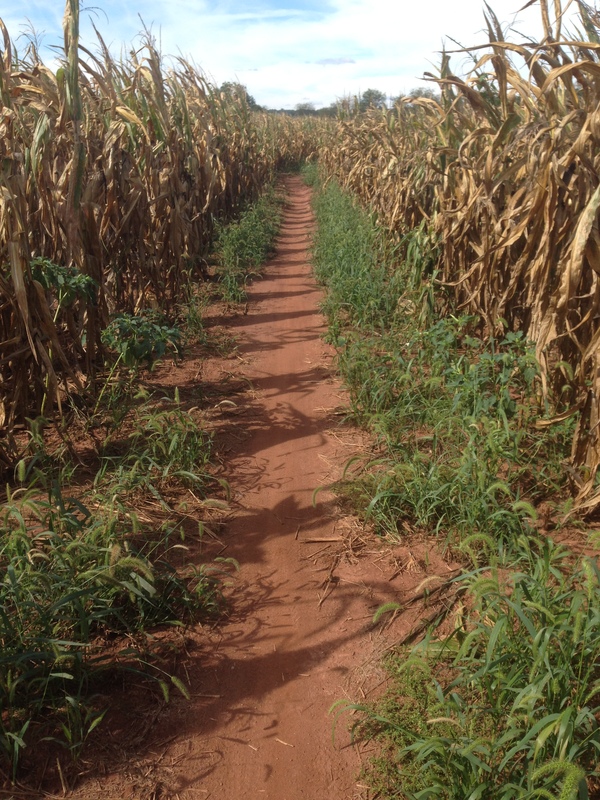 If one follows the Yellow Trail out to the further reaches, one emerges into the perimeter of the farmland itself, and ultimately one crosses over a dirt road with rows upon rows of corn to one’s right and left. 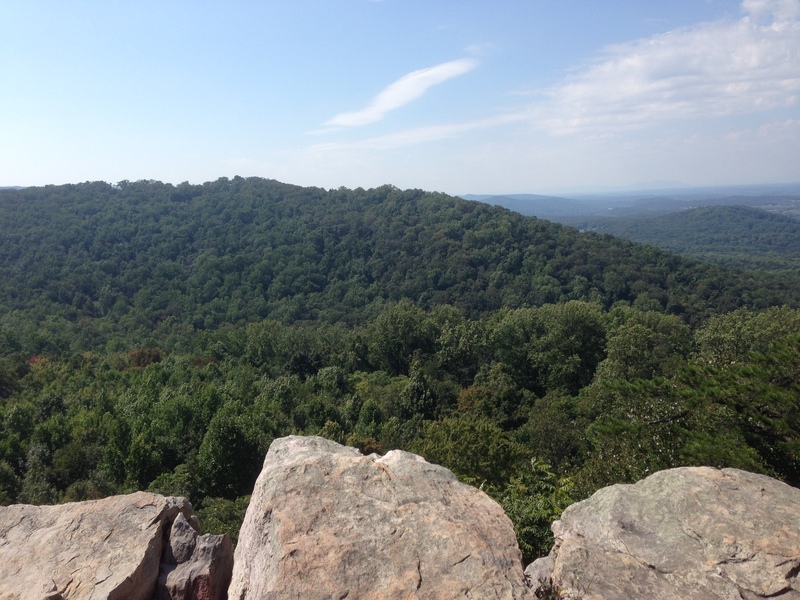 Thus, this hike offers alternative scenery to the Maryland hiker looking for a change from the woods. On September 7th Tod and I ventured over to Damascus Regional Park to hike the Lower Magruder Trail and the Magruder Branch Trail. The trailhead is at is a very populated area, near picnic areas, tennis courts and other outdoor activities. In fact, on the day we went there, a 5K race was just finishing up in the park. It was kind of funny to see a water station at the beginning of the trail! The first part of the trail is asphalt. This is great for folks using wheel chairs. Before long, a path winds up a hill and the blue-blazed dirt trail feels more like one is in the middle of the woods, not a metropolitan area. I loved the serene nature of the trail. This seems like a really great trail for those who want an easy hike, with few hills, few rocks, etc. That isn’t to say that there isn’t some ascents. 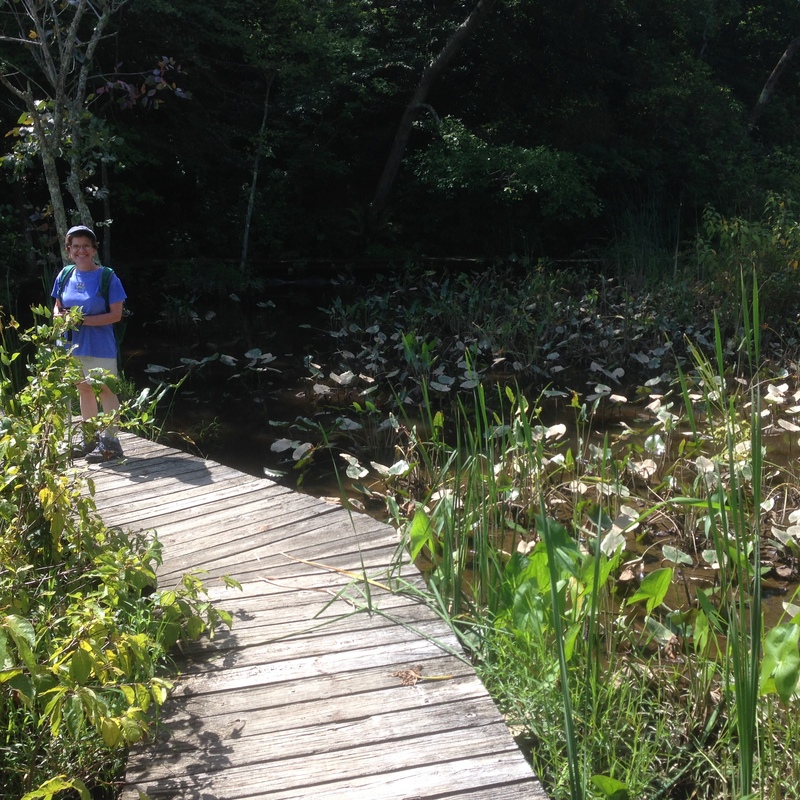 It is just that it offers a great way to ease into hiking if one is a beginner. Before long, one crosses Log House Road. 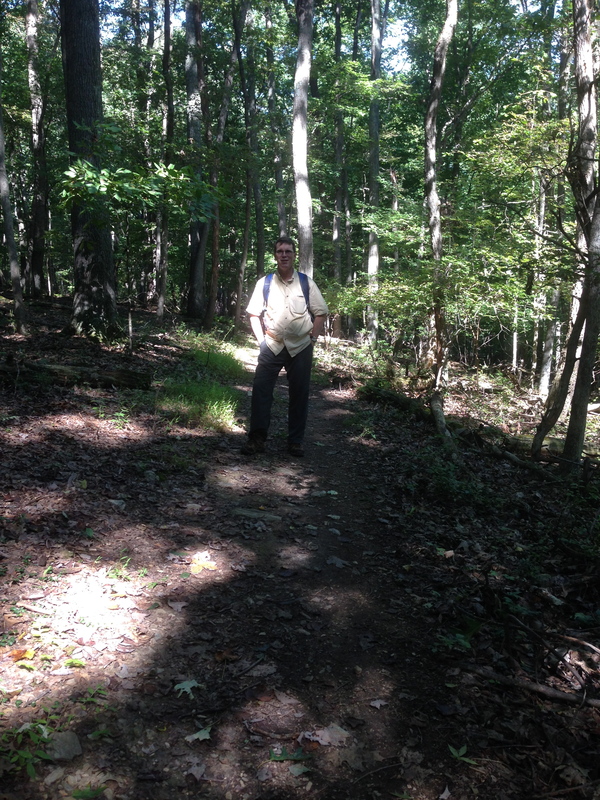 By going left, we began hiking the Lower Magruder Trail. 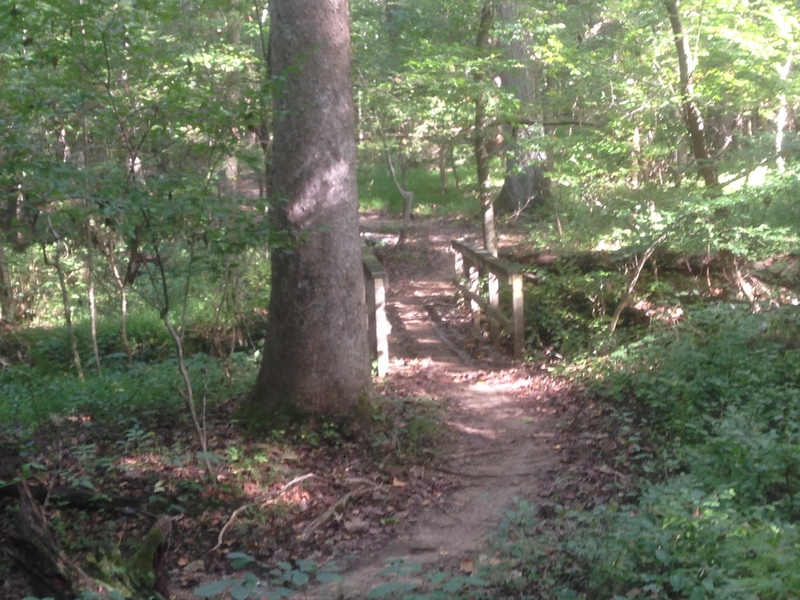 The trail follows a creek. This is an out and back trail, so we had the option to turn around any time. We decided to cross Wildcat Road to continue with the trial. This required walking along the road a bit to pick it up on the other side. After going for about another mile we decided that the scenery and mud wasn’t worth it. We turned back. I guess there are a few advantages to out and back hikes. It was kind of interesting to see the trail from a different perspective. Still, I think my favorite hikes are loops. This was fun and is a great option for those living in Montgomery County. My appreciation for the parks available to us continues to grow! Yesterday Karen and I opted to go someplace that we hadn’t been before. 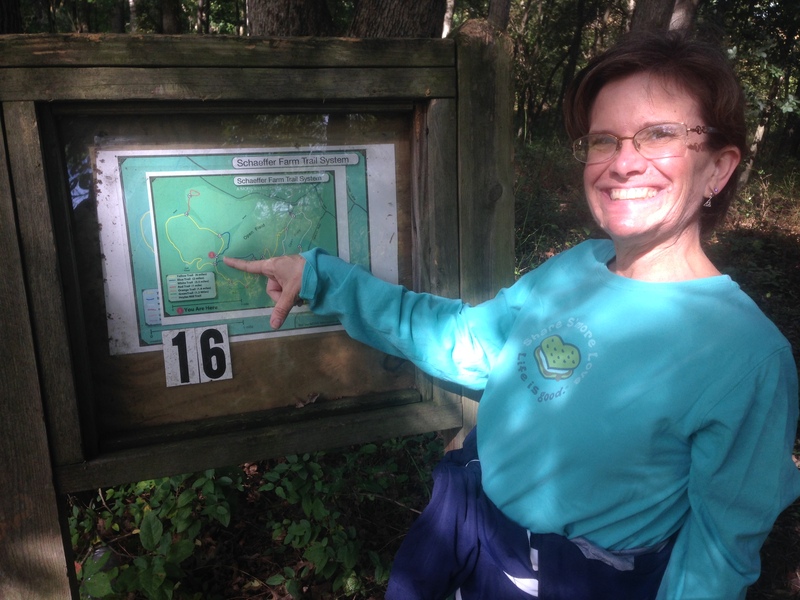 We found a description of Patuxent River Park (in the Jug Bag Natural Area) in the book Washington D.C.: 60 Hikes within 60 Miles. The hike discussed in the book seemed too complicated. We thought we could follow the trails based on the map that we picked up at the Visitor Center. All of the trails are blazed, and there are several trails, each with its own color. The difficulty for the hiker is that the trails frequently circle round and intersect. It would be easy to get lost or end up in a section of the park opposite than one intended. At each step, you really have to know where you are at in relation to the map, or else you probably will get momentarily perplexed. The trails are, for the most part, smooth, with few roots and rocks. (Just when I thought it was safe to look up, I stumbled over a root and ended up sprawled across the trail.) 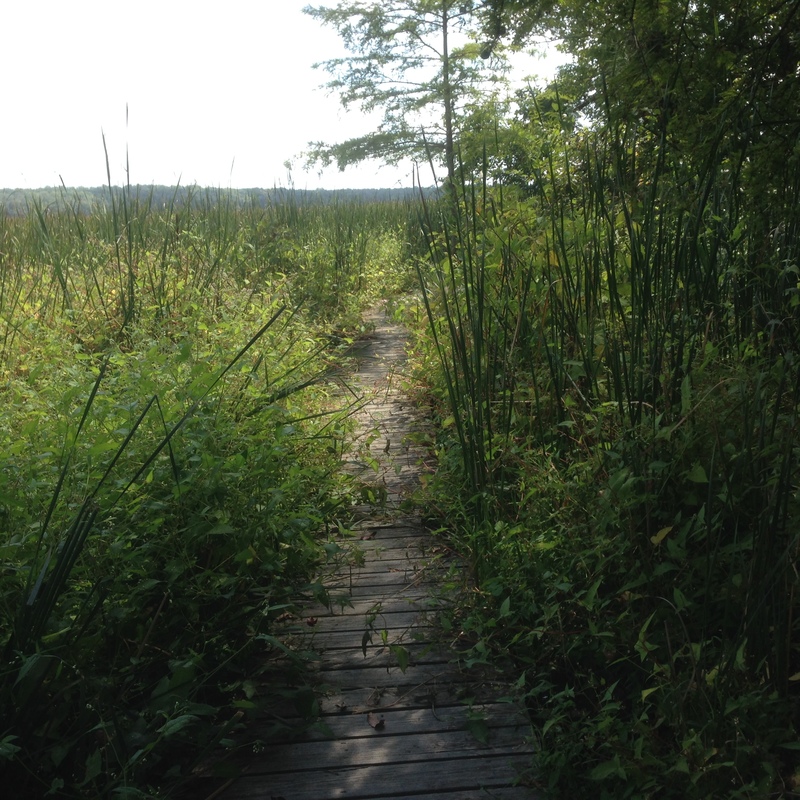 The brown trail enters onto a wooden platform that actually takes one out into the marsh. You won’t find this everywhere. We could hear the osprey out toward the bay. The humidity was very high, and the air was stale and oppressive. With sweat running down our cheeks, Karen and I decided not to take the red trail out to the far end of the park. We wimped out and settled for 3 miles. In that short distance we twice crossed paths with deer and frogs, so we feel that our hike, short as it was, was by no means a total loss.